LGBTQ Pride Adjustable Bracelet - You Pick Your Gemstone! 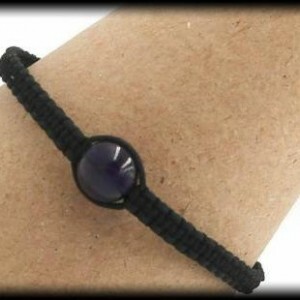 Simple yet this bracelet speaks volumes! Pick your favorite gemstone to add to your bracelet as a center piece and focal point. Whether you need a boost of confidence, to remove blockages, increase love in your relationships, motivation, calming your mind and emotions, or just to enhance your love of life you will find a stone to fit your specific needs. Sodalite Chakra Healing: 5th Chakra - Throat Chakra | 6th Chakra - Third-Eye Chakra Stimulates the release of old mental conditioning while releasing fears, phobias, guilt and other mechanisms that hold you back as it enhances your self-esteem, self-acceptance and self-trust. Amethyst Chakra Healing: 6th Chakra - Third-Eye Chakra | 7th Chakra - Crown Chakra Opens your intuition to create a deeper understanding of life, while also supporting sobriety and overcoming addictions and blockages. Extremely powerful and protective stone. Rose Quartz Chakra Healing: 4th Chakra - Heart Chakra Known as the stone of unconditional love, it will aid with compassion, love, friendship and relationships. Lava Rock Chakra Healing: 1st Chakra - Root Chakra Creates purpose, determination and motivation while giving you strength, courage and stability. It also acts as an essential oil diffuser. Add 1-2 drops to a single bead no more than once every 24 hours. Orange Carnelian Chakra Healing: 2nd Chakra - Sacral Chakra | 3rd Chakra - Solar-Plexus Chakra Restores vitality and motivation while stimulating creativity. It also helps to boost self-worth and self-confidence. Moonstone Chakra Healing: 7th Chakra - Crown Chakra Helps to calm emotions and overreactions while opening the mind. Also balances hormones while soothing emotional instability and stress. Red Jasper Chakra Healing: 2nd Chakra - Sacral Chakra Known to be an excellent choice for "worry" beads, also unifies all aspects of your life and encourages honesty with yourself as it brings a great deal of courage into your life. 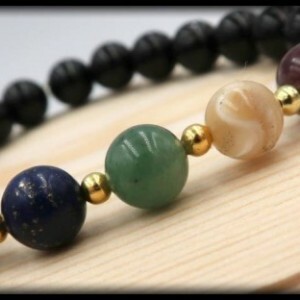 Black Onyx Chakra Healing: 1st Chakra - Root Chakra Provides strength and support during difficult and/or confusing circumstances while also encouraging you to be the master of your own destiny. Black Tourmaline Chakra Healing: 1st Chakra - Root Chakra Attracts tolerance, prosperity, compassion, inspiration, and a positive attitude. It also clears and balances all of the chakras while removing stress. Pink Tourmaline Chakra Healing: 2nd Chakra - Sacral Chakra | 4th Chakra - Heart Chakra Cleanses the heart chakra, promotes peace and relaxation while also attracting love and working as an aphrodisiac. Clear Quartz Chakra Healing: 7th Chakra - Crown Chakra Acts as a deep soul cleaner while raising energy and unblocking good energy. Also known as the Master Healer, it works to absorb, store, release, and regulate your energy. Green Moss Agate Chakra Healing: 4th Chakra - Heart Chakra Encourages personal growth, trust and hope all while promoting new ideas, self-expression and communication. Also known as the stone of new beginnings and the stone of wealth.